Living in San Salvador, El Salvador, one gets used to the various people who flock to your car at the stop lights to ask for money. Gato was one of these people whom I slowly got to know as I would drive by him on my way to work. A friendly, clean cut young man of about 21, he lost both his legs to a land mine during the savage twelve-year civil war which took place in this country. In a developing nation where the majority of the people struggle to make ends meet, Gato was just another victim of the lack of progress. However, instead of being angry or bitter about his unfortunate condition, he faced life with a smile and happily exchanged greetings with passing drivers in the hopes that some spare change could buy him another meal. The boy was taken by Gato’s words and split his “treasured” sandwich in half and gave a piece to his friend. Gato smiled at them and said, “That is good. We must all help one another in anyway we can.” With this, he reached into his pocket and took out all of his accumulated change — about two dollars, or a day’s worth of food — and gave it to the two kids, telling them to buy food for their families. El Salvador is slowly progressing on its way to meeting the demands of its citizens. 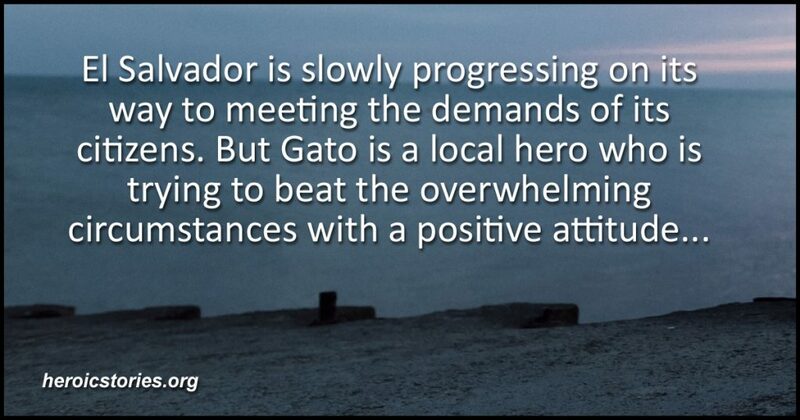 But Gato is a local hero who is trying to beat the overwhelming circumstances with a positive attitude, positive influence and a heart of gold. And in that he has made a positive difference in our world. It would be wonderful to find a positive update nineteen years later!